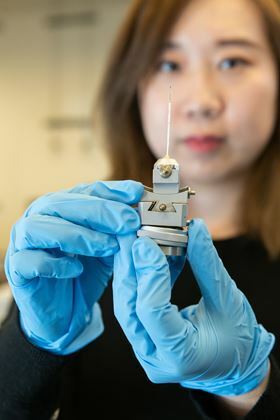 Graduate research assistant Xuetian Ma holds a reaction vessel similar to that used to study nanoscale crystal formation; the vessel comprises a high-strength quartz tube about a millimeter in diameter and about two inches long. Photo: Allison Carter, Georgia Tech. High-energy X-ray beams and a clever experimental setup have allowed researchers to watch a high-pressure, high-temperature chemical reaction and to determine, for the first time, what controls formation of two different nanoscale crystalline structures in the metal cobalt. The technique allowed the continuous study of cobalt nanoparticles as they grew from clusters of just tens of atoms to crystals as large as 5nm. This research provides proof-of-principle that the new technique can study crystal formation in real-time, which has potential applications for other materials, including alloys and oxides. Data from the study produced ‘nanometric phase diagrams’ showing the conditions that control the structure of cobalt nanocrystals as they form. The research, reported in a paper in the Journal of the American Chemical Society, was sponsored by the US National Science Foundation, and used US Department of Energy-supported synchrotron X-ray beam lines at Brookhaven National Laboratory and Argonne National Laboratory. "We found that we could indeed control formation of the two different crystalline structures, and that the tuning factor was the pH of the solution," said Hailong Chen, an assistant professor in the George W. Woodruff School of Mechanical Engineering at the Georgia Institute of Technology. "Tuning the crystalline structure allowed us to control the functionality and properties of these materials. We believe this methodology could also be applied to alloys and oxides." In bulk cobalt, crystal formation favors the hexagonal close-pack (HCP) structure because it minimizes energy to create a stable structure. At the nanoscale, however, cobalt also forms the face-centered cubic (FCC) phase, which has a higher energy. This structure can also be stable, because the high surface energy of small nanoclusters affects the total crystalline energy, Chen said. "When the clusters are small, we have more tuning effects, which is controlled by the surface energy of the OH- group or other ligands," he explained. "We can tune the concentration of the OH- group in the solution so we can tune the surface energy and therefore the overall energy of the cluster." Experimentally, the researchers reduced cobalt hydroxide in a solution of ethylene glycol, using potassium hydroxide to vary the pH of the solution. This reaction takes place under high pressure – about 1800 pounds per square inch – and at more than 200°C. In their laboratory, the researchers used a heavy steel containment vessel that just allowed them to analyze the results of the reaction. To follow the reaction process, however, they needed to observe it in real time, which required the development of a containment vessel small enough to allow for X-ray transmission while simultaneously handling the high pressure and high temperature. Ma and Chen used this setup during four separate trips to beam lines at the National Synchrotron Light Source II at Brookhaven and the Advanced Photon Source at Argonne National Laboratory. X-rays passing through the reaction chamber to a two-dimensional detector provided continuous monitoring of the chemical reaction, which took about two hours to complete. "When they started forming a detectable spectrum, we captured the X-ray diffraction spectrum and continued to observe it until the crystal cobalt formed," Ma explained. "We were able to observe step-by-step what was happening from initial nucleation to the end of the reaction." The X-ray diffraction results confirmed theoretical predictions and computational modeling done by Yifei Mo, an assistant professor in the A. James Clark School of Engineering at the University of Maryland. Mo and colleagues Adelaide Nolan and Shuo Zhang used density functional theory to describe how the crystal would nucleate under differing conditions. According to Chen, the success with cobalt suggests the methodology could be used to produce nanometric phase diagrams for other materials, including more complex alloys and oxides. "Our goal was to build a model and a systematic understanding about the formation of crystalline materials at the nanoscale," he said. "Until now, researchers had been relying on empirical design to control growth of the materials. Now we can offer a theoretical model that would allow systematic prediction of what kinds of properties are possible under different conditions." This story is adapted from material from the Georgia Institute of Technology, with editorial changes made by Materials Today. The views expressed in this article do not necessarily represent those of Elsevier. Link to original source.